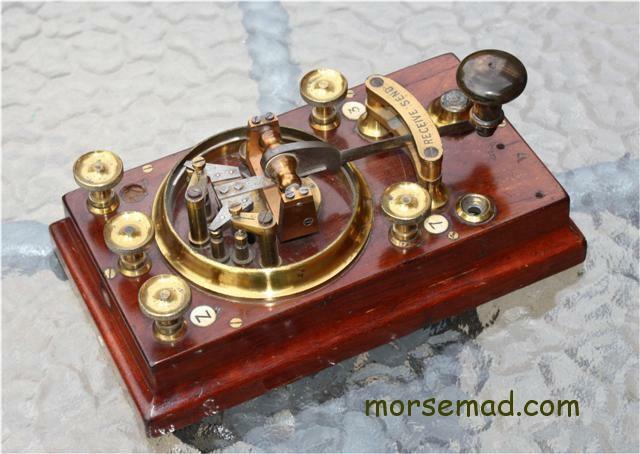 The Most Beautiful Morse Telegraph Key In The World. 062. .....GPO Double Current Key labelled "GPO No 62". A beauty of a morse key in lacquered brass with a superb mahogany base. The base measures 8 & 1/2" by 5" (215mm by 125mm) The design is quite unique as you can see by the photos, with the whole arm swivelling between SEND and RECEIVE. A "STROH Patent Key circa 1868. Augustus Stroh, born 1828 was a German emigre to London and among other things, was the inventor of the "STROH VIOLIN" a sort of violin amplified with a saxophone style of bell. 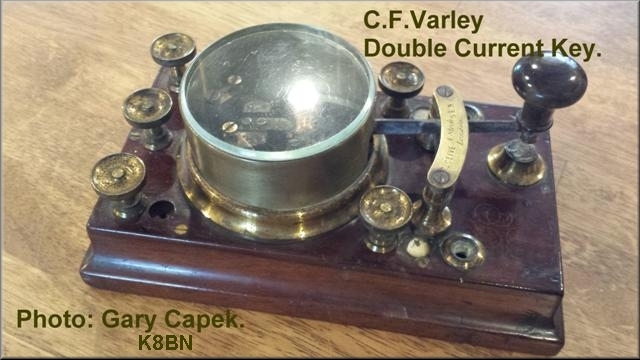 Atlantic Cable.com - C. F. Varley. 1828-1883. 062b. ..... On the right can be seen a photo of the Stroh key in the RECEIVE position. Moving the complete arm, including the two middle contacts on their V shaped mounting (with two coil springs), over to the SEND position, lines up the upper and lower contacts, enabling keying. On the front edge of the base is etched "CITY & GUILDS (ENG.) COLLEGE E.E.D. K10". 062. .....GPO Double Current Key labelled "GPO No 157". 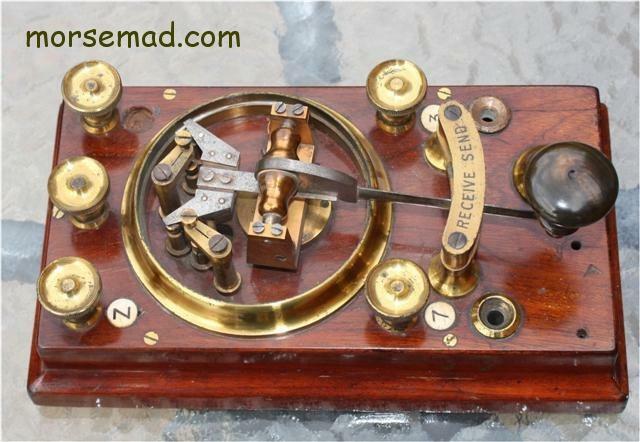 Engraved "A. STROH, LONDON"
Stroh telegraph key with its original round glass topped cover. A. STROH patent key c1868. Photo by kind permission of Gary Capek / K8BN.